How the new Post Format plugin icons may look. The new Post Formats UI feature for WordPress 3.6 has been pulled from the core and relegated to a plugin. Mark Jaquith announced the change on the Make WordPress Core blog yesterday, saying that it was a “hard decision” and that an “overwhelming consensus had been reached among the core developers” that the new UI, or User Interface was just not ready yet. This is the piece of the puzzle that has delayed the timely release of version 3.6. Jaquith said he should have made the decision to pull it earlier, but that letting it stay in would have been a worse mistake. Read on for the extraction plans and what this means for your site. If your theme supported Post Formats, then you’ll see only minor changes with what they leave in. They will enable all formats by default, but the custom screen options will go back to what is there now. The new audio/video support will be left in the core. That’s important because it marks a step forward toward full adaptation of HTML5. If you want the rest of the new UI features, they will be available as a plugin that you’ll be able to get once the 3.6 version is released. If your theme doesn’t already support Post Formats, none of this will really matter to you. Just because WordPress updates the core in any way doesn’t mean that your site will automatically begin to take advantage of the new features. In other words, if your theme didn’t support it before, it won’t support it after the update. The exception to that may be the new HTML5 embed code being recognized when you want to include a video or audio snippet in your post. Many premium themes, including Genesis, only support a limited number, if any, Post Formats now. The emphasis on featuring them in the upcoming release of 3.6 was a way to promote them to more theme designers, among other things. Some folks complain that so many Post Formats will make WordPress look more like a Tumblr blog, and don’t like them. I’m in that camp too. I think Tumblr is more for casual bloggers who want to share pretty pictures and brief updates. But then, a lot of super marketers have a presence on Tumblr, mainly to drive backlinks to their main WordPress sites. Were you looking forward to the new Post Formats feature? Does your blog support them now? Will you be getting the plugin? Let us know in the comments. I never had post formats on my sites. One week ago, I was thinking to take it seriously, but found out yesterday that it won’t be included in 2.6 release. So sad , but well.. It’s all about perfection! I would go for the plugin only if I can integrate it with my theme. I run a slew of news sites for radio stations and I was very much looking for post formats, if for no other reason than a greater sense of organization. Fortunately, it will still be available via the plugin and I agree that with the existing resistance, it needs time to breath and mature. I think this is the best possible solution for that to occur. Dave, I hadn’t thought of it that way, but it makes a lot of sense. With the plugin option, some folks will jump on it and start helping the rest of us acclimate to the look. And betting that will make more folks want it too. While the text of your article accurately describes what happened (i.e., only the new UI for Post Formats has been removed), the title is misleading. 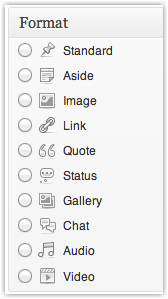 As I know you now, the Post Formats theme feature has been in WordPress since 3.1 (Feb 2011). I happen to think Post Formats are a GREAT thing. Used wisely, Post Formats will NOT necessarily “make WordPress look more like a Tumblr blog”. Rather, I think they’ll liberate bloggers to write more engaging content in their blogs. Jeff, I guess it depends on how you use your blog, and how casual it is. I read your post. But, I think of my business blog very differently than I do my personal blog. I think many of the post formats are not appropriate for a business blog and won’t inspire more writing there. Most of the business bloggers I know run an editorial calendar six months in advance. I run mine at least three months in advance, but leave room for topical items as they come up. On the other hand, I’ve seen several multi-author business blogs doing more “top of mind” posts in the past six months. And I’ve seen some folks nearly abandon their business blog in favor of making more posts exclusively on G+ because the SEO is faster and better. So, I guess it’s what works best for engaging with your audience. And for some folks, maybe adding more post type options will do it. > editorial calendar six months in advance. > but leave room for topical items as they come up. To each his/her own, of course. Which is what you said, too. But things change and paradigms shift. How many (few) years ago was WordPress JUST for blogging? How old is Twitter? How many of us can count the time we’ve been using Google+ in days? I think Post Formats is one of those things that, over time, could encourage people to shift their paradigms about what a business blog is. Maybe the way we’ve always done it doesn’t have to be the way we always do it. … you’ll see how I’ve been experimenting with some other post formats – namely just Links, Quotes, and Asides. Standard post formats are still my staple and will continue to be. But do those quotes and links and asides make my blog less professional, less useful? Maybe you think so. I’d be interested. Might some of my blog readers (if I actually had any) appreciate some of these short non-standard posts? That’s my hope. What I like about these other post formats (especially links, asides, and quotes) is that I no longer feel obliged to put my shorter “words of wisdom” ONLY on Facebook or Twitter. The bottom line for me is that the flexibility offered by post formats lets us turn our blogs into one-stop shops. I see that as a good thing. Thanks for replying; I’m enjoying the conversation. And I certainly respect your opinion, perspective, and insights. Delighted to have divergent views in the thread, Jeff. I have a pretty big list of folks who have my blog posts delivered via email on BlogAid. So, I would definitely want to be respectful and not bombard them with those little snippets of wisdom that way. Maybe if there were an easy way to exclude them from the RSS feed on the fly, I’d consider it. Now, for my personal blog, yeah, I can see doing that. But, I get so much more engagement on social media for those little snippets and images and such, that I’d just as soon post them there for now. Like you said, the whole social media culture, blogs included, is evolving. Right now folks over on G+ are going bonkers over the AutoAwesome thing that resembles animated gifs, but with real photos. And then there’s Google Glass and folks showing us the most mundane parts of their lives, like we’re as interested in their new toy as they are. So, I imagine Post Formats will go through a play period for a while and have a lot of hype, and then settle into its own culture of use. And marketers will find a way to exploit it too, as they do with everything. I’m going to check out your blog where you are using them and betting it will give me ideas for future use. It’s good to try new things. Just want to be respectful of my audience too. > from the RSS feed on the fly, I’d consider it. Really appreciate you including those links here, Jeff. I’ve got dev and designer buddies that will enjoy them. But, I also know that most of my clients are not going to want to get into anything this complicated just to use post formats. > this complicated just to use post formats. “Most” of your clients? Do you mean to say you have SOME who WOULD? I’m not suggesting clients do anything of the sort. Sorry if I gave you that impression. It’s definitely something a developer would do. For clients who want to use different post formats but – like you (and me, for that matter) – don’t want posts in certain post formats (link, aside, status, quote) to be included in an RSS-to-Email campaign.